Home > News > Greenwich Sexual Health Week! The Royal Borough and METRO Charity teamed up last week to encourage residents to think about sexual health and get tested during Greenwich Sexual Health Week. From Saturday 24 November to World AIDS Day on 1 December, the team visited different areas of the borough to offer sexual health advice and free condoms, as well as Chlamydia screens for under-25s, to help encourage residents to take control of their sexual health. 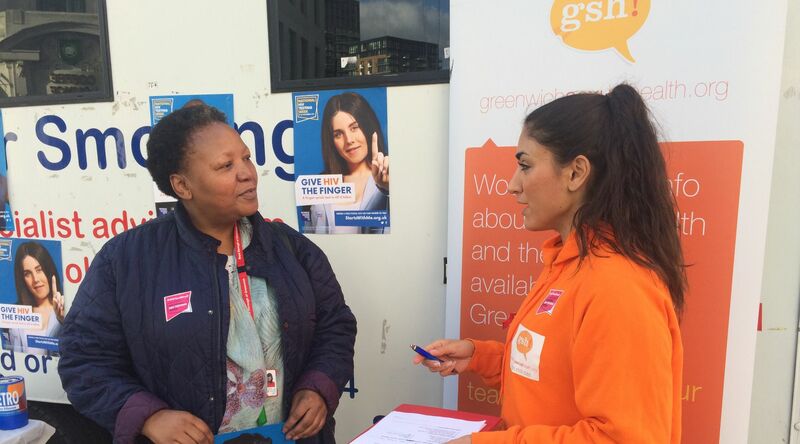 The highlight of the week came as an HIV testing bus stopped off in Woolwich’s General Gordon Square on Friday, 30 November, to offer rapid HIV testing (results in 60 seconds), free condoms and advice about sexual health to passers-by. Councillor Averil Lekau, Cabinet Member for Adult Social Care, Health and Anti-Poverty, made a special appearance, to see first-hand the range of services that are available free of charge to Greenwich residents. Improving upon last year, the outreach team carried out a whopping 70 HIV tests in total, up from just over 50 when the bus was stationed at the same location during Greenwich Sexual Health Week 2017. Residents can have a free test, any time of year, at a number of local sexual health walk-in clinics across the borough. Walk-in services not only offer free testing for a range of sexually transmitted infections (STIs), they also provide a wide variety of contraception, including free condoms, as well as confidential advice and support. Find a walk-in service near you. An estimated 13,500 people living with HIV in the UK are unaware they are infected, putting them at higher risk of poor health and passing the virus to others. Treatment for HIV has improved significantly but there is still no cure. People infected with HIV and who are taking treatment can live long, healthy lives, but early diagnosis is critical to the best health outcomes. For details of Greenwich Sexual Health services and further information about Greenwich Sexual Health Week, please call 020 8305 5005 or visit www.greenwichsexualhealth.org. You can also search for @METROCharity and #GreenwichSexualHealthWeek on Twitter, Facebook and Instagram.